Closely following the blossoming of Sweet Vernal-grass the famous Kentucky Blue-grass adds the delicacy of its graceful panicles to the common garden of the wayside. 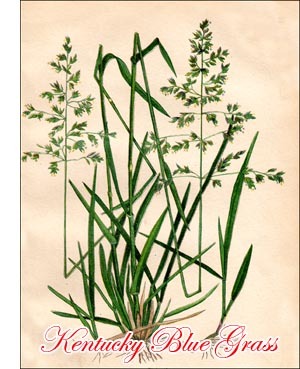 Although well known, by name at least, few seem acquainted with the fact that this is one of our most common grasses from the Atlantic to the Pacific. Its most luxuriant growth is attained in the far-noted blue-grass region of Kentucky, on limestone soils in the counties about Lexington, that "city of the Blue-grass," but even in the more eastern states the slender stems are seen as frequently as are those of any other grass of early summer, and the profusion of dark green leaves, together with the habit of spreading by sending off numerous running rootstocks, renders it an ideal turf-forming grass. June Grass, as this species is often called, is really a more appropriate name than Blue-grass, as the plants lack the deep blue-green colour which characterizes Canada Blue-grass, the true "blue-grass" of the genus. The blossoming head, in varying shades of green, lavender, and purple, is in form a perfect pyramid, and as the flowers bloom in June, before the summer grasses, the plants should be easily recognized. In dry or sandy soil the grass is small and harsh, but in richer grounds the stems are from two to four feet tall, and later in the season, when the green has faded, they stand like threads of shining gold by every wayside. Kentucky Blue-grass. June Grass. Poa pratensis L.
Perennial, with rootstocks. Naturalized in the Eastern States, indigenous elsewhere. Stem 8'-4 ft. tall, slender, erect. Ligule very short. Leaves 1"-3" wide, flat, stem leaves 2'-6' long, basal leaves much longer. Panicle 2'-8' long, pyramidal, open, branches slender, lower branches 1/2'-3' long. Spikelets 3-5-flowered, about 2" long, green or purplish. Outer scales acute, unequal, roughish on keels; flowering scales acute, webby at base, downy below on marginal nerves and mid-nerve; palets nearly as long as flowering scales. Stamens 3, anthers often deep purple. Waysides, fields, and meadows. May to August. Throughout nearly, the whole of North America.